Well, I was not the only one hoping for dry roads. The plans were for us to leave on Wednesday to go to Maryland for the Thanksgiving holiday but the weather report on Monday evening was frightening so when Russell came home from his council meeting we started gathering our things together and we left early Tuesday morning to get ahead of the approaching winter storm. The highways were already crowded with travelers and it took most of the day to reach our destination. Fortunately the delays were for construction and not an accident for which we were all thankful. Soon after we arrived at the hotel Carol and Martha came to take us to dinner. Esther and Russell were so pleased to be able to have dinner at Ferdinands. It is their very favorite restaurant. They used to have dinner there several times a week when they lived in the area and the owner always makes them feel so welcome when they return for a visit. I even got to get out of my carrier for a few minutes so I could see the surroundings. A most pleasant experience. On Wednesday we spent the day at the house watching Carol and Martha prepare the special dishes that are traditionally served at Thanksgiving dinner which is the highlight of the holiday. It appeared to be a lot of work. 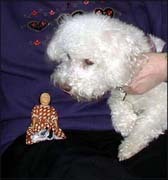 Food to a doll is not important but staying out of the clutches of the family dog Phyllis was the main concern for me. Later in the day Ben arrived and like our last visit he received all the attention. He is an adorable little boy and behaves very well. I do wonder, however, how his life will change when he becomes a brother in the spring. Thursday was the day of the feast. This holiday is all about tradition and that includes a football game on television. Even watching the team from Texas win over the family's favorite Redskins seems to be part of it. Other guests arrived and the dinner was served in the late afternoon. I got to view the turkey close up in the kitchen before it was carved. This is one experience I do not wish to repeat. I much prefer watching from my vantage point by the fruit and glasses. From the conversation after the meal my conclusion is that everyone ate far too much. This appears to also be part of the tradition. 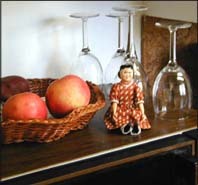 Since food is not part of a doll's life I could have no understanding or sympathy in such matters. This was a day to be thankful for one's blessings and I was just thankful for my existence. The last day of our visit was Friday and the ladies all went shopping. I did not go along. It is the start of the Christmas shopping season and I know I will learn much more about this in the near future. We came home on Saturday and again were fortunate to have good travel conditions. No sooner had we arrived at our house when the snow began to fall. When one is warm and cozy indoors it really is quite a pretty sight with the houses all decorated with lights for the season. I had had my first holiday and a good night's rest was now in order.